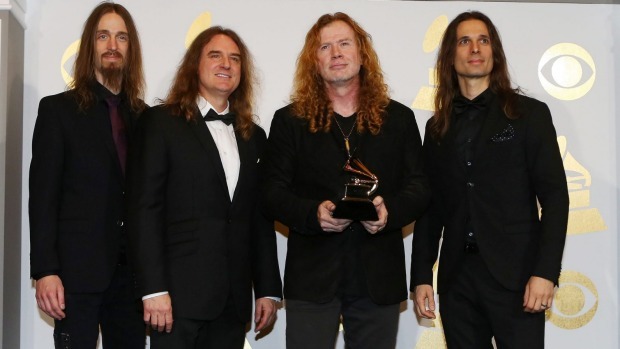 While Adele had won all the huge awards at the Grammys, heavy metal outfit Megadeth had also won their first ever Grammy award after eleven nominations since 1993. The thrash metal band took home the award for Best Metal Performance for their 2016 album “Dystopia” at the 59th Annual Grammy Awards. However, in a somewhat awkward turn of events, the Grammy house band played Metallica’s “Master of Puppets” as Megadeth walked down the aisle to accept their award on stage. Thankfully, Megadeth’s lead singer Dave Mustaine who was the original lead guitarist and one of the founding members of Metallica, didn’t seem to mind it at all as he walked down the aisle while playing air-guitar to the classic song. Check out the awkward moment!